Courgette is now in season so make the most of it with this courgette, feta and mint tart recipe. To make this as flavourful yet light as possible I also used a little added halloumi alongside the feta but you could always use extra feta if you prefer. This will make two 12 inch tarts or one larger one so get your apron on and get cooking! To make this as simple as possible I used readymade shortcrust pastry to save time but feel free to make your own if you fancy. 1. Start by preheating your oven to 200c/ 180 fan; do check the instructions on the pack of pastry you have bought in case the temperatures are slightly different but this is a rough guide. Line your tart tin (or tins if making two smaller ones) and blind bake for 10 minutes. You can do this by placing a layer of baking parchment on top of the pastry and adding baking beans, dried beans such as kidney beans or rice to hold it down. You really do need to blind bake otherwise the base of the tart will be soggy and unappetising. After the ten minutes, I then removed the lining and baked for a further 5 minutes to make sure that the base cooks well. 2. Whilst that is in the oven, crack the eggs into a bowl and lightly beat; emphasis on lightly! Add in the cheese, mint and seasoning. Now comes the star of the show: the courgette. I finely sliced two thirds of the courgette and added this to the egg mixture. I then sliced the remaining courgette so this could be layered across the top of the tart when it’s assembled but you could add it all through the egg if you prefer. You could also sprinkle an extra bit of feta or halloumi over. 3. Fill each tart tin with the egg mixture and cook for around 15 minutes until the egg has set. Allow to stand for a few minutes before serving- nobody wants to burn their mouths on scalding egg! Serve with a salad and dig in! Courgette, feta and mint tart- a celebration of summertime! 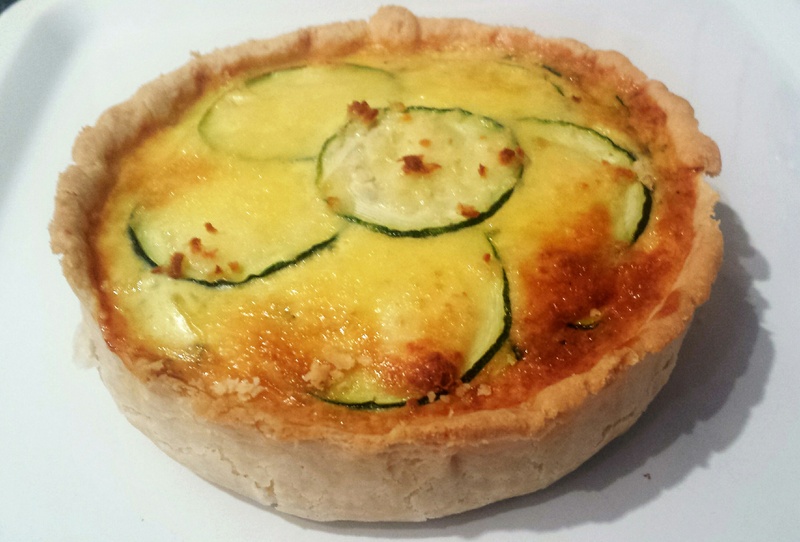 This entry was posted in Recipes and tagged courgette, egg, feta, halloumi, mint, quiche, shortcrust pastry, tart by sotiris14. Bookmark the permalink.